The public first got a glimpse of the caverns underneath the hills of northern Ohio in 1897 when a local farm boy tried to find out where the water was going as it was drained out of the field. After digging down several feet he found an opening to a cave. That was the first exploration that soon opened up an underground exploration that eventually would be called Ohio Caverns and captured the nickname as being the most beautiful of all Ohio caves. In 1925 a larger, more extensive cave system was discovered. As sediment was removed by hand and buckets, the cave system that we see today began to reveal itself. 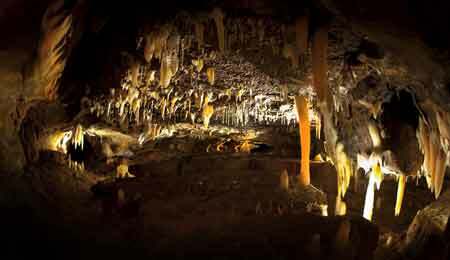 This newer section had a variety of calcium deposits that formed both stalactite and stalagmite formations. In many areas the walls are covered with rust colorations that providing dramatic compositions. 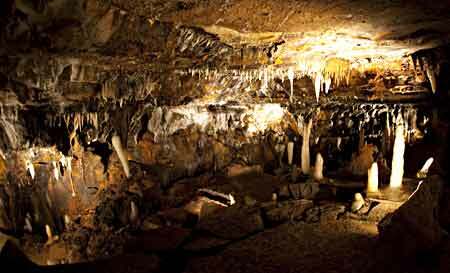 Ohio Caverns is still an active cave system meaning that the formations are still being formed from the continuous drip of water. Our guide pointed out one particular formation of a stalactite on top and the mirror image stalagmite on the bottom were almost touching. The two formations were just 1/16" apart yet he said it would take another 40 years for the two to join and become a column. In other areas there were columns hanging from the ceiling and stopping in mid air. Visitors actually had to duck to pass underneath. It was explained that when the cave was excavated, the sediment had to be removed to complete the passageway, yet the formation was preserved, leaving it suspended. Today the 35 acre park is open year round except for Christmas and Thanksgiving. The cave temperature is a year round 54 degrees. Most of the cave tour is relatively flat except for descending a set of stairs at the beginning, but at the end of the tour you're faced with a climb of 65 steps that bring you back to the surface. A park is located directly above the cavern and contains shelter houses, picnic tables, gemstone mine and a playground. 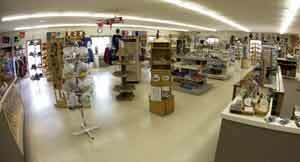 A souvenir and gift shop is located within the entrance building. A courteous and attentive staff is at your service.